*Price is for Classic Kit. Includes GST and is shown in USD. The Graffiti Run, the World’s Most Colorful 5K offers more color per participant than any other color runs in the industry. We are dedicated to a slow growth pattern, hosting only a handful of events each year. The Graffiti Run can assure that each event gets the concentration and dedication they deserve to put on a premium event. Join the world’s leading 5K in customer service and satisfaction and register now! Want to advertise your product or service to fun loving Graffiti Runners? Click the button below and fill out a sponsorship form and send it to sponsorship@thegraffitirun.com! The Graffiti Run will start at 9am with the final wave being sent out at 11:00am. Runners will be sent out in waves every 30 minutes. When you are done with the run, enjoy yourself at our after party to bask in your colorful accomplishment with great music and dancing (great dancing is not guaranteed)! We HIGHLY recommend you use Uber or carpool. However, please DO NOT drop off at the event venue in Capilano Park. Instead, drop off at the marked bus stop at Borden Park (next to Northlands east lot) where shuttles will take you to the venue and back. If you are NOT using Uber or carpool, you can park in the Northlands east lot (marked in blue on the map) across from Bonanza Park. Buses will shuttle participants from the marked bus stop to the venue and back. We HIGHLY recommend that you pick-up your packet at our Packet Pick-Up before the event. 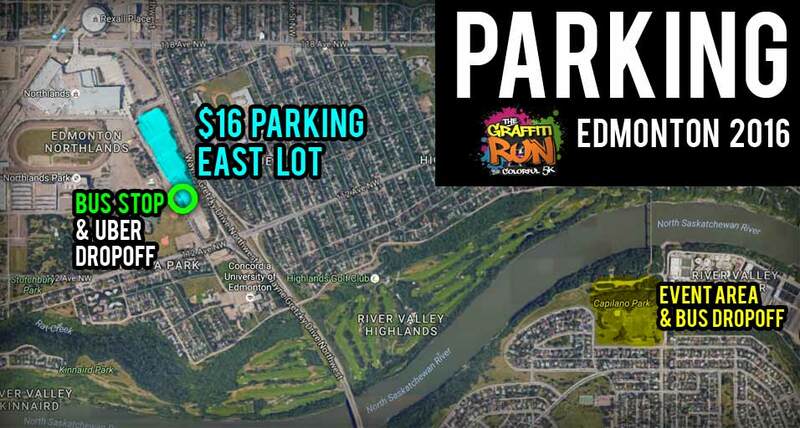 This will allow you to skip the long check-in lines on race-day and mosey right on over to the start line!Packet pickup for The Graffiti Run – Edmonton will be held at the Running Room for two days. You can show up on either day to pick up your packet. Be sure to bring your signed waiver! The Graffiti Run Edmonton will happily donate a portion of our proceeds to The Mustard Seed! The Mustard Seed is a Christian non-profit organization that builds community, grows hope, and supports change. Across its three ministry locations across Alberta, The Mustard Seed seeks to address the root causes of poverty through the delivery of basic services, housing, employment and the provision of a safe, supportive community for those in need. You can donate to The Mustard Seed here. 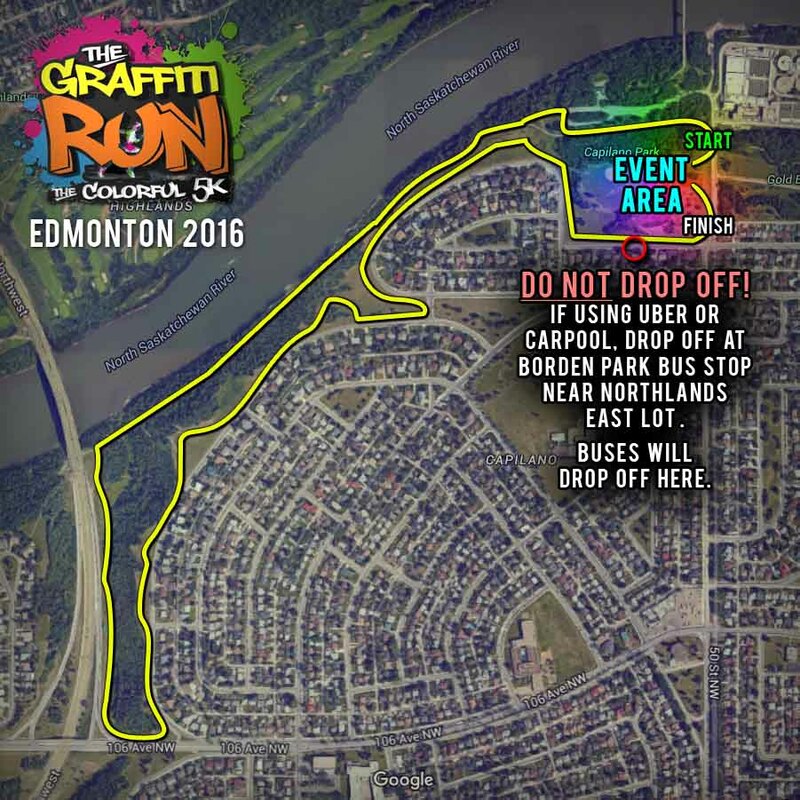 Want to be a part of the Graffiti Run Edmonton but don’t feel like jogging? Join the Graffiti Squad and pelt people with color; join the Registration team and help check in the soon to be colorful Graffiti Runners on race-day; or join one of the pre-race volunteer opportunities to help us setup the event on 8/27/16! To volunteer, simply select the “Edmonton Volunteer” option above and then register. What is included in my Deluxe Graffiti Run registration Kit? Under this Kit Graffiti Runners will receive one entry into the Graffiti Run event, an awesome Graffiti Run headband, a runners bib, limited edition T-shirt, Two Color Packs, One TuTu, One pair of sunglasses, One Pair of Retro Socks, One Retro Wig and One Buff! What is included in my Basic Graffiti Run registration Kit? Graffiti Runners will receive a custom Graffiti Run T-shirt, an awesome Graffiti Run headband,a Runners bib and a bag of color to use at the post-race color party. We will also provide water. Where can I find the required waiver to sign for the event? When I push “Register Now” I get a screen that says my shopping cart is empty? How can I register and get colorful? I don’t like to carry a lot of things while I run, is there a bag check? The Graffiti Run will not hold a bag check, so be sure to leave what you don’t need in your car or in the capable hands of your friends! How do I transfer my Graffiti Run registration to another person? You can transfer your registration to another person for a $3.00 fee and $2.00 processing fee. To begin, click on “sign in” at the top left hand side of this web page. Enter the email address and password you established while registering to log into your account. Then hit “view/edit” over the registration in question. Once you are at your registration, simply change the name in the First Name and Last Name sections to reflect the transferee’s information. Press save to finalize the transaction. How do Graffiti Run Teams work? A Graffiti Run team is a collection of Graffiti Run participants who register under the same team name. The main benefit of a Graffiti Run Team is it makes it simpler to recruit friends and to view your team members’ registration status (incomplete or complete) through your Ticketsocket account. You also get the chance to constantly perform your awesome team chants and battle cries during the race. The minimum number of team members is one. Yes. You can be on a team by yourself. Go team you! Teams/Groups can go up to as high as you wish them to be. No limits to the army of graffiti runner you can have at your back. CHARGE! How do I redeem my Living Social, GroupOn, or other coupon? 2. Be sure you are using the right code, all Living Socials and Groupons come with two codes and it can be confusing on which one to enter to redeem your purchase so here is a couple tips. Groupons will look similar to this “ABCDEFGHP” there will be no hyphens in the code you will use to redeem your Groupon. Living Socials are similar they will look like the following “GR11111111” no hyphens again. 3. Be sure that your total is “Free” after you apply your code, that will let you know that everything went through correctly. You will only have a total if you added additional purchases such as more color packs or a fabulous TUTUIf you follow the previous advice and are still getting an error, please contact us at support@thegraffitirun.com, to expedite the problem solving process in your email please give us the city you are signing up for along with the code you are using, we will get everything sorted. My GroupOn/Living Social code isn’t working! What do I do now? 2. Be sure you are using the right code, all Living Socials and Groupons come with two codes and it can be confusing on which one to enter to redeem your purchase so here is a couple tips. Groupons will look similar to this “ABCDEFGHP” there will be no hyphens the code you will use to redeem your Groupon. 3. Your total will be “Free”, make sure that is so before you finish registration. If you follow the previous advice and are still getting an error, please contact us at support@thegraffitirun.com, to expedite the problem solving process in your email please give us the city you are signing up for along with the code you are using, we will get everything sorted. Is the Graffiti Run timed? The Graffiti Run is not timed. We encourage you to take your time during the most colorful 5K out there and enjoy the color madness with your friends and family. You are certainly free to wear a watch to track your race time…that is assuming you can read your watch through the inevitable layers of color powder. Can I pick up my registration packet before race day? Yep. The time and location is different for each city, so be sure to check your email inbox, our event Facebook page and our website the weeks leading up to the run for packet pick-up information. If you do not make it to packet pick-up your race packet will be waiting for you on the day of the race at the Participant Check-In Tent (this line can get pretty long on race-day, so we recommend showing up at least thirty minutes early to pick up your packet the day of the race). What do I need to bring to the Packet Pickup/Race? You will a printed copy of a waiver if you did not sign the waiver online as you were registering waiver(click “waiver” to see a copy of our waiver you can print!) along with an ID. You only have to check in once, so if you go to the packet pickup you are all set to go on race day! So go to packet pickup! I chose the shipping option when registering, when can I expect my packet? Packets for events will be sent out roughly 2 weeks before the event takes place, this is done so you will not have to keep track of everything for a long period of time. Packets will only be sent if you choose the shipping option during registration. My buddy lives far away/he’s busy/I lost a bet, can I pick up his packet? Yes you can, in order to pick up another person’s packet you will need two items. You will need their signed waiver along with a photo of their ID (minors under 18 do not need an ID), we will take the waiver and you will keep the ID. The photo of the ID can be through a camera phone, however we will need a physical copy of the waiver. Can spectators attend the post-race color party? Yes! The more colorful people the better. We will have color powder packets available to purchase on a first come/first serve basis until we sell out. However, spectators should be warned that the color at the post-party cannot tell the difference between a spectator and a Graffiti Runner…so they should be prepared to become colorful! Are cameras or phones allowed in the Graffiti Zones/post-race Color Bash? They are certainly allowed just need to apply for a media application here. Do we recommend them? Well, we’ll just say that our cameras are placed about 20-30 feet away from the color fun. If you want to get pictures right in the middle of the color action we recommend you purchasing our Kodiak Case at the event to protect your phone/camera. What if I am not an avid runner and not used to running 5k? Can I still get my Graffiti Run on? Absolutely! The Graffiti Run is all about fun and color. Feel free to run, walk, crawl, or somersault your way through the color craziness. Should I really wear all white? As long as you are wearing a mostly white shirt at the starting line you are good-to-go. This shirt can certainly have your team name, logo, or any other graphic that inspires you. Remember, the more white you are wearing the more colorful you will be when you reach the finish line and, therefore, the happier your outlook on life will become. Will the color ruin my clothes or shoes? Okay, this is a more reasonable question. Most of the color will wash out of your clothing with a good-old-fashioned clothes washing. As with traditional brown dirt, the quicker you wash the clothing the better. However, we recommend that you wear clothing that you do not mind becoming at least a little colorful. Also, if you’d like to try to salvage the colors on your clothing we’ve heard reports of the following method working well: spray the colorful clothes with vinegar, iron, and wash.
Will the color turn me into a rainbow powered super-hero or have any other awesome or not-so-awesome side effects? That would be awesome, but unfortunately the color is 100% safe and does not have any negative (or amazing) side effects. As with any substance, it is best to not get it in your eyes and our special team of color administrators have been taught to aim for the midriff and not the face. Some Graffiti Runners wear protective eye wear and/or a bandana around their face to be on the extra cautious side. What is the color in The Graffiti Run? The color powder at The Graffiti Run is simply the single most powerful source of happiness on the planet. You need more details? Fine. Our color powder is a non-toxic, non-rash inducing corn starch based product. It is 100% natural and safe. I love being colorful, but how do I get it off after the race? We will have air blown color cleaning stations near the finish line. With a good blow dry, you aren’t 100% clean, but it’s close enough for rock n’ roll and you are good for the car ride home. Once you get home a hot shower and soap should do the trick. Will the color stain the inside of my car? Most people bring some towels to sit on to protect their precious car seats. Just think about it as a trip to the beach. What would you do to protect your car from multi-colored sand? Just do that and the inside of your car will remain its usual, boring, non-colorful self. Do I get color in my packet? Yes, we give you one free color pack! Also if you make any additional purchases through the check out we will give them to you at packet pick up! You can also purchase additional color the day of the race. Is there actual graffiti at the Graffiti Run? The only “graffiti” occurs when our volunteers paint you with our joyous color powder. No spray paint is involved in anyway and no actual graffiti or vandalism will occur at the event. Simple, click on the involvement tab and then select Involvement Volunteer! Select your city and that will take you to a registration screen, answer the questions and you will be registered to participate in the most colorful 5k there is! I have some free time the day before your event, can I get in for cheap? Indeed you can, if you volunteer the entire day before our event at your city’s packet pickup then you will receive a free registration! Do you donate to a charity or good cause? We sure do. Each Graffiti Run donates a portion of proceeds to local charities. Everything from scholarship funds to Special Olympics to city cleanup/beautification projects and everything in-between. We are all about beauty here at the Graffiti Run. Beautiful color on our participants and the beautiful causes of our local charitable partners. If I am unable to make it to the Graffiti Run can I get a refund? If you purchased Ticket Guardian insurance with your registration, you can file a refund claim at http://www.ticketguardian.net/claims/ or follow the link/call the phone number in the confirmation email you received. Otherwise, the tickets are unfortunately non-refundable.Please just make sure you are good to go before signing up! You can alternatively transfer a registration to another person (see next question). You can only bring your kids along if you want to be considered the coolest parent in the neighborhood. Children under ten get to register at a highly discounted price! They will receive everything a grown up’s registration would afford them which is a t-shirt, a headband, a color pack and a bib. Note that if your child is young enough for a stroller (as in he’s not actually running), he does not need to register, however he will not receive a packet. My child only has high amounts of energy when he is close to my expensive china, do I have to register him? Children 10 and under will need to be registered, however you can get them in at a highly discounted price, use the saved money for repairs on your expensive china! If your child is young enough to stay in a stroller, then he does not need to be registered. Is there an age limit for the Graffiti Run? Nope. No age limit. You just need to be able to walk, run, or ride the three miles of color happiness. If your child is young enough to ride in a stroller he will not need to be registered. Children under 10 who have the act of running and walking down will need to be registered at a discounted rate. What if my child is too young to run? How about a jogging stroller? Sure! As long as you don’t mind it getting hit with color as your rock it through the run. Can I run with my dog? Is Rex invited? While we love Rex, unfortunately he or she cannot attend the Graffiti Run. No dogs are allowed at the Graffiti Run.